Our message is simple: keeping a 12,000+ pound Orca whale in a pool, (that is less than a fraction of 1% of his natural habitat,) is simply illogical. “Extracting” an animal from his natural environment, where he would normally swim vast distances, dive to extreme depths and spend his entire life with his close knit family pod is simply unethical. To use a living, breathing, self-aware and extremely intelligent sentient being as a sperm bank in a forced captive breeding program, and as a part-time splash-machine for the enjoyment of the paying public is, considered by many, simply appalling. To claim that this is ocean conservation is simply inaccurate and grossly misleading. This Orca’s name is Tilikum and he has been living in a cement pool since he was taken from his mother’s side in the ocean at the young age of approximately 2 years old. He was captured in November of 1982. Unlike other cetaceans living in captivity, Tilikum’s interaction with the SeaWorld’s trainers and with the other whales kept there is very limited because of his proneness to aggression. We believe that 30 years of forced breeding, splashing audiences, and performing for SeaWorld’s profit is enough. 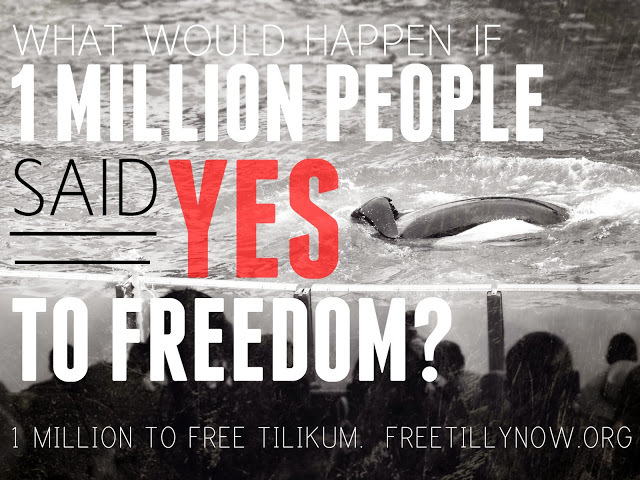 Our goal is quite simple: we want to gather 1,000,000 signatures to free Tilikum. If you agree that this situation is illogical and simply unethical, please add your name to this petition and help us reach our goal by sharing it with your friends. By signing this petition, you’ll be sending a clear, responsible message to the leadership at SeaWorld and the Blackstone Group (the owner of SeaWorld)- a message that cries out for the release of Tilikum to a seapen for rehab. It’s time to end the archaic use of these beautiful cetaceans for entertainment and profit. It’s time to free Tilikum! We appreciate your voice as you help us take a stand for the voiceless. Click to sign the petition here.